What do you think of Tuscany? Not only gorgeous nature, but delicious dishes like this one. Probably you have not yet taste it, but we warmly advice a round of this “leccornia”, that is the magnificent Caciucco (Caciuccio fish stew), a great mix of white fish and shellfish. If you go there, together with Florence, Pisa and Siena, do not forget to go to on the coast and visit Livorno. You can’t leave the Tuscany region without trying a bit of this fish stew, served with fresh slices of Italian roasted bread, brushed with garlic! Ready to put the bread inside caciucco and let it absorb properly the fish soup? Mmmmm, so tasty! Although in Italy the fish stew’s recipes can vary from town to town, the most famous Cacciucco you will find in the town of Livorno (Tuscany). You should find in it “pesce con lisca” (whole fish with bones) and “pesce da taglio” (boneless large round fish in cutlets or fillets). The ingredients? Inside Caciucco there is all the mediterranean flavours coming fro the sea! Red Gurnard (one whole fish), John Dory (one whole fish), Monkfish (one tail piece), huss (one fillet), turbot (one fillet), mussels, king scallops, prawns: all together to make a great fish stew!!! Originally this dish was part of the poorest family tradition: now it is one of the greatest dish of Italian culinary cucine! The original recipe would require red mullet, baby octopus or small cuttlefish and “pannocchie” (that is, mantis shrimps). Do not forget of course extra virgin olive oil, and the chopped onion, garlic, celery stalk, carrot. Inside to give taste and flavour it will be of course a bit of dried chilli, chopped tomatoes, the ever present parsley, a full glass of white wine to stir the “soffritto” and give an extra taste, and of course fish stock cubes for 2 litres of boiled water. Ready to order caciucco in some “trattoria” or restaurant? 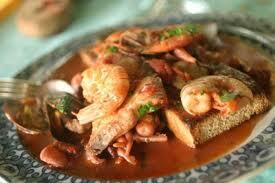 This specialities is always tasty, whenever you will find in Livorno! This entry was posted on Tuesday, May 3rd, 2011 at 8:40 am	and is filed under Italian Recipes and Food. You can follow any responses to this entry through the RSS 2.0 feed. You can leave a response, or trackback from your own site.